Naoki Maru builds robots that he then enters into Japan's Robo-One, a competition where bipedal humanoid robots battle one-on-one. As if that were not awesome enough, he recently was inspired by the movie Real Steel to create a boxing robot that will shadow your movements, allowing you to control its actions in the ring. The robot, dubbed the Real King Kizer, uses the Asus Xtion Pro Live sensor to capture your movement, in much the same way that Microsoft's Kinect motion controller for Xbox 360 does. The robot then mirrors your actions in near-real time. 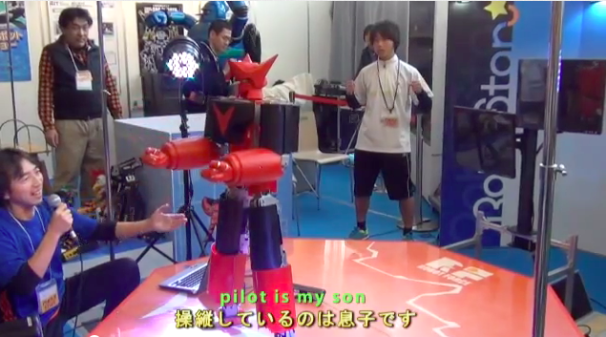 The video above shows off Real King Kizer in action at the RoboStsr Festival, with Maru's son in the driver's seat. Unfortunately, the slight delay in response and the lack of any real force in the punches suggest that Real King Kizer might need a little more training before he enters the ring. No word yet if it could hold up to the Bionic Bopper Cars or mech warfare bots.